Communication Governed by Fear or the Great Commission? To fulfill the Great Commission, we’re going to need to communicate with people. However, fears and insecurities can hold us back. Perhaps we have an introverted personality. Maybe a lack of training makes us feel disqualified. Our poor communication skills may have led to bad past experiences. Whatever it might be, we somehow let these fears and insecurities govern what we say and do rather than be governed by the Great Commission. And, we’re not just talking about a fear of public speaking as discipleship can happen one-on-one, informally, not just in a formal group setting. We can be riddled with fear of what people will think and how they will respond. What if they won’t even listen? What if they won’t change as a result? We might be afraid of failure. 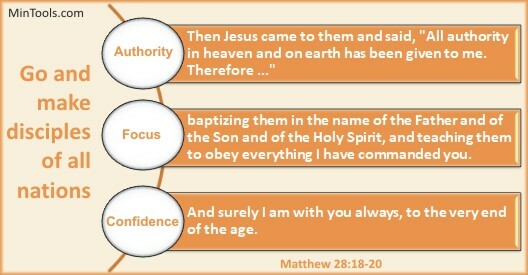 As we look at Jesus’ Great Commission to “go and make disciples” we find three realities in Matthew 28:18-20 that should help us in our communication as we go about Jesus’ mission to make disciples. These realities don’t negate our need to learn to better communicate but they should remove excuses for failing to try regardless of how introverted of a personality we might have, lack of training, or any other hindrance.